white viscose sleeveless lace blouse jane norman size 10. Condition is Used. Dispatched with Royal Mail 2nd Class. Features a ruched scoop neck with elasticated detailing & turn up sleeves. 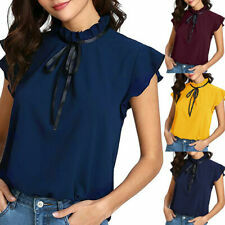 ~ Ladies Lovely Button Down Cap Sleeve Jersey Top fromPer Una (M&S) ~. Nice design in grey with a multi butterfly print in blue, yellow, white. It has a tie at back, camisole can be detached. Ivory Lace top. Size xl, approx equivalent to a UK 16 to 18, Condition is Used. Dispatched with Royal Mail 2nd Class. (naughty) Sheer Silk Top. UK 12. Gorgeous Cream Vintage Style. Bows And Buttons. (naughty) Sheer Silk Top. UK 12. Gorgeous Cream Vintage Style. Bows And Buttons.. Condition is Used. Dispatched with Royal Mail 2nd Class. Great condition. Cream sheer vintage style blouse. Size 12. Covered buttons up left side opening which continue up front to neck. Diagonal ruffle detail on front. Cap sleeves with draw string ties. Mandarin style collar. 2 covered button fastening at back of neck with small opening below. Slight stretch to fabric. Body hugging. Size is neat. Pit to pit 17 inch approx. Shoulder to shoulder 14 inch approx. Neck 14 inch approx. Lovely summer party top. Message if have any questions. Made in a semi sheer grey fabric that has a crinkle effect. Pretty sequin & beading detail to the front. 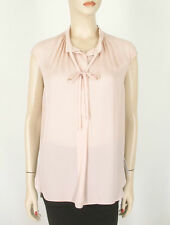 Beautiful blouse by New Look. Ribbon trim down the front and to the sleeves. nd class limit. Labelled size 10. Broderie Anglais/lace. 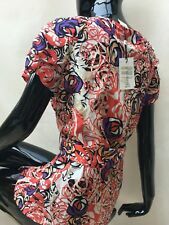 Pretty top from Boden. Fabric Content: 65% cotton, 19% polyamide, 16% viscose, lining 100% cotton. Flattering cap sleeves. Length shoulder to hem 23". Care information: Machine washable. M&S Autograph Black/purple pure Silk Cap Sleeve Blouse With Embroidered applique Trim. Condition is hardly worn excellent. Length shoulder to hem 27.5".